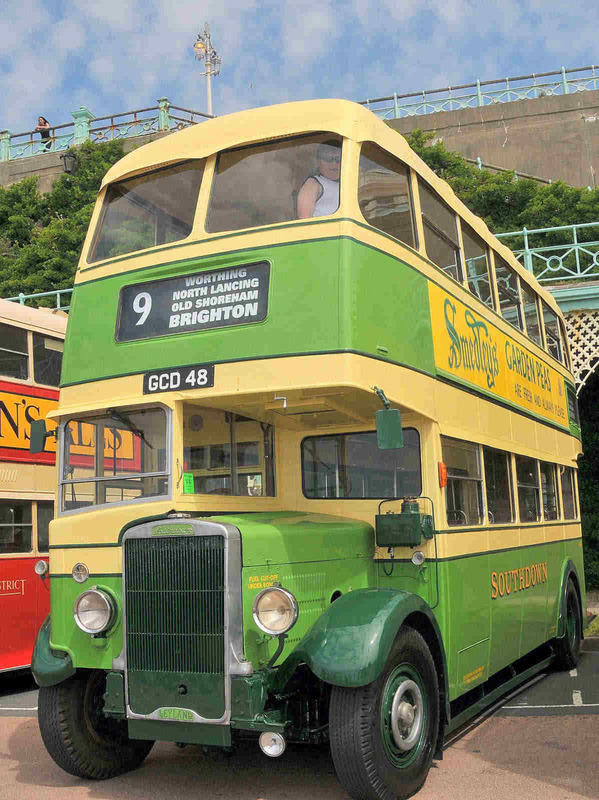 Brighton and Hove Buses are one of the largest and most successful bus companies in the country. 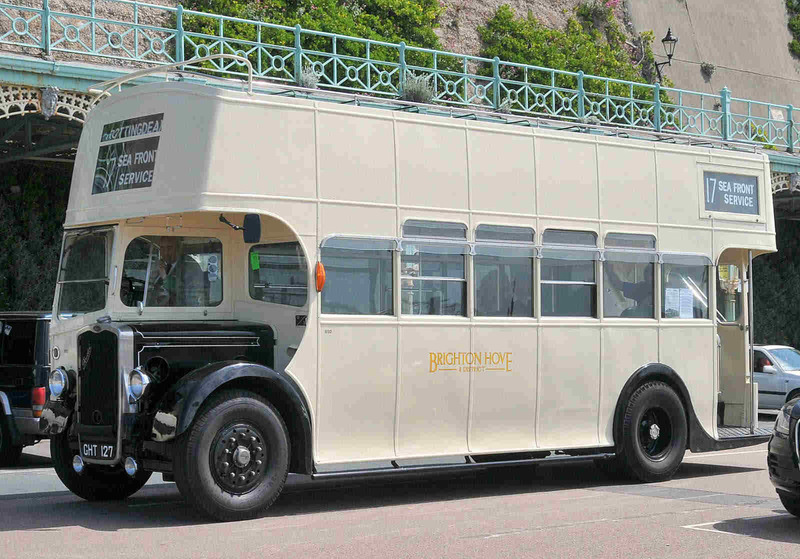 They celebrated their 75th Anniversary with a rally on Madeira Drive on June 13th. 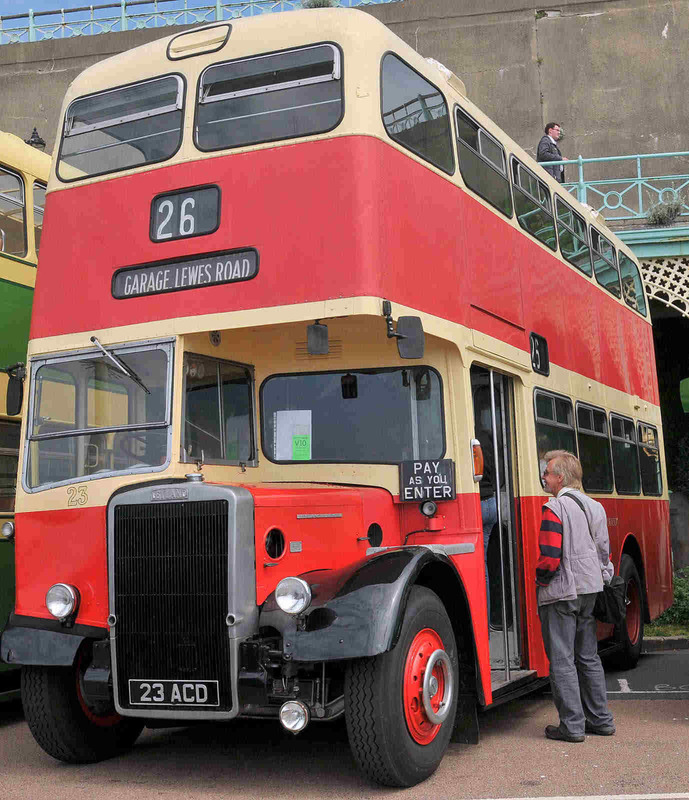 Over 50 buses, old and new, were on display as well as stands offering lots of bus memorabilia. It was a terrific day for bus enthusiasts. 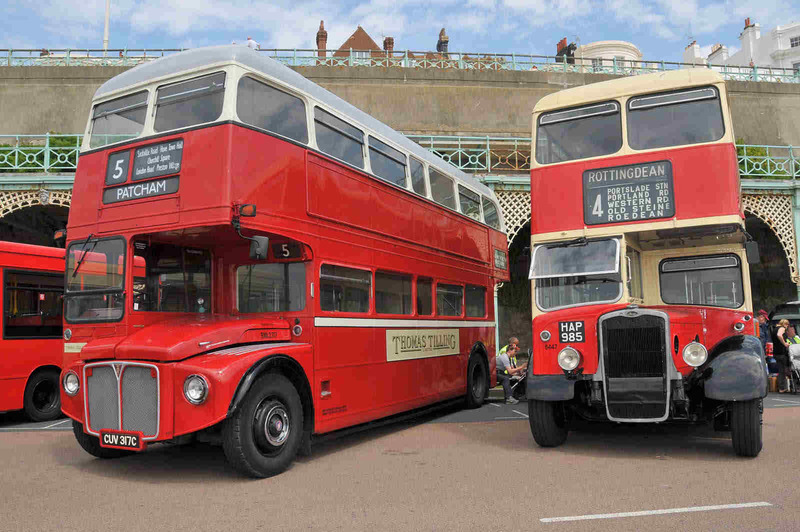 So for those My Brighton and Hove bus geeks that couldn’t make it – here are a few of the buses on show. My Dad worked for Southdown between 1953 and 1983. 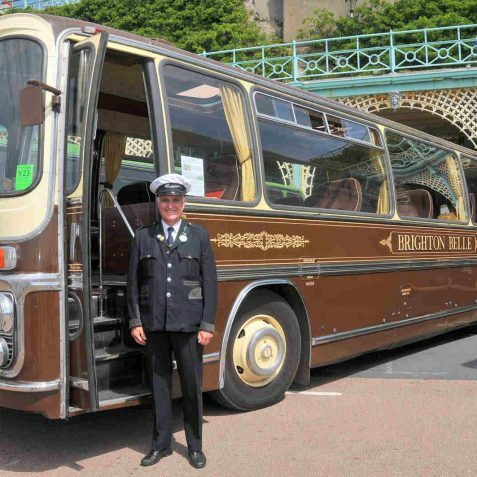 He started as a conductor, became a driver, then was a driver-courier on Southdown luxury tours and finally an inspector. It was a shame that Southdown got nationalized – the spark seemed to go out of it after that. There was quite a family feel to the company as I recall when I was a kid growing up in Brighton. Hopefully something like that has been rekindled in some way. 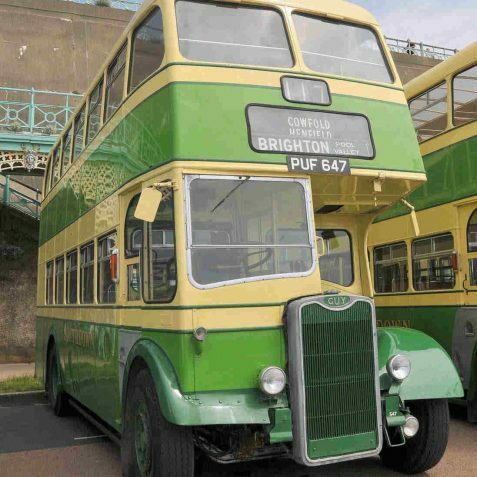 My favorites – I have to say – were the Brighton Trolley Buses. What acceleration they had….great memories for sure. I lived on Springfield Rd so would take the 26 and 26A or the 46 and 46A regularly. When I first visited San Francisco some years ago, I was taken aback by the familiar whine of electric motors and the metallic twitching sound (as best as I can describe it) of trolley arms clattering over points at the intersection of Montgomery Street and Columbus Ave. Made my hair stand on end. 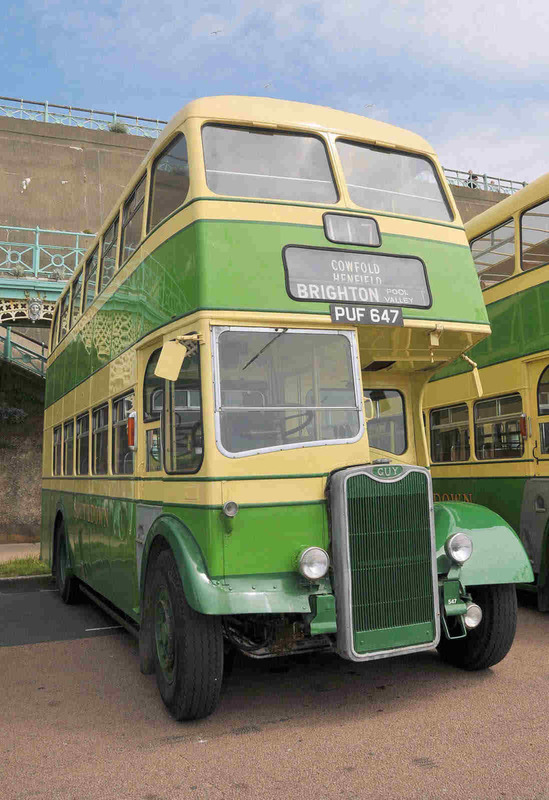 Rather than a Routemaster, I would have preferred to see Brighton & Hove Buses spending money on a Bristol Lodekka, the original OPN series being my particular favourite. 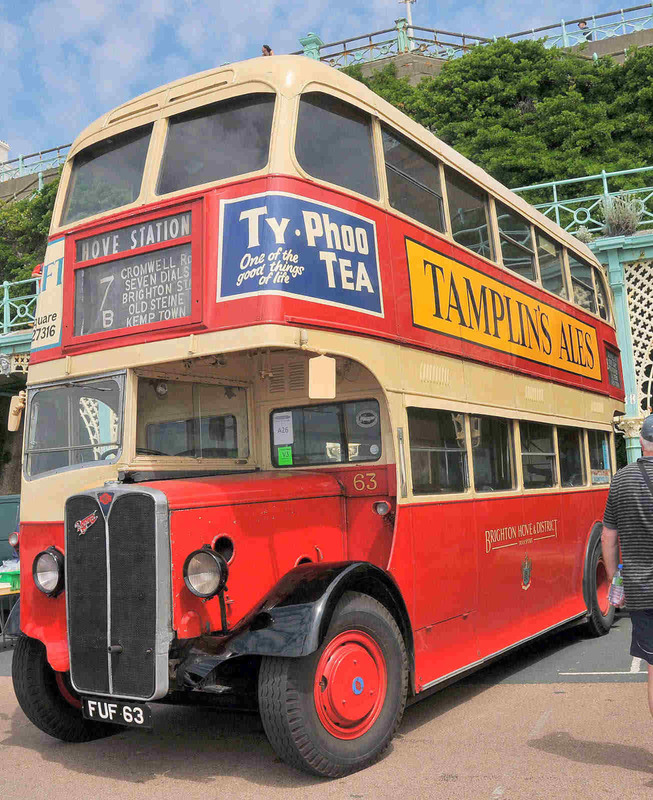 Like Phil, I still miss those purring trolley buses in Brighton. Now we have to go to places like Carlton Colville to see them in action. I drove this bus between 1974-1977. 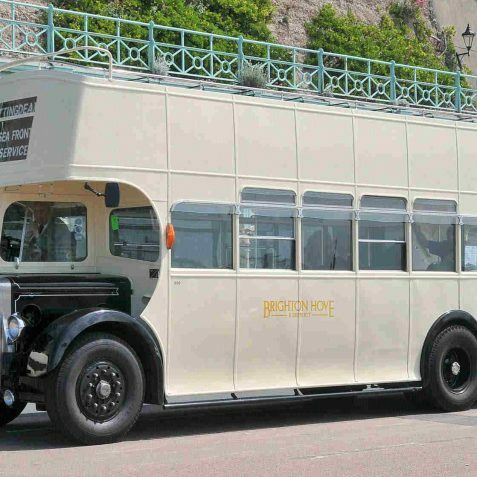 The bus was the first one-man operated double decker in Great Britain…unless someone knows better? I started as a bus conductor in the early 1960s and left in the late 1960s. I use to think we seemed to carry as many passengers then as there are to day. The buses then were a bit of a rough ride but my hat goes off to all the guys who where part of an extremly good service. I know the days of the ‘conductor’ are long gone but I have never forgotten the good times, the helping hand for the frail, waiting for a running customer and the sense of humour we exchanged. Hi Phil, I remember your Dad as Bill Allsopp. What a lovely man, along with his good mate Eddie Calvert also an inspector at Pool Valley. My dad, Sean Howlett, used to be a conductor between 1976 and 1981 in Pool Valley. He remembers Bill Allsopp. Does anyone know Barry Jurd and Joe Jurd? 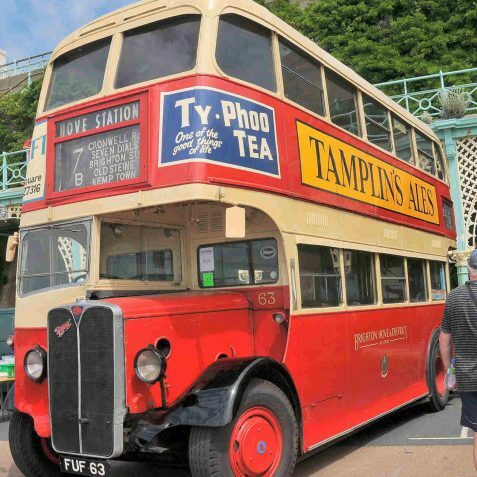 The photos of the buses bring back many memories for me in Brighton when I lived in Bennett Road. In the early 70s I worked for Harrimonds at the Hyde in Bevendean as a security guard at night. My other duties were driving the array of buses and coaches to take the girls to and from work in the morning and the evening after work and also taking the girls home after the late shift at night. 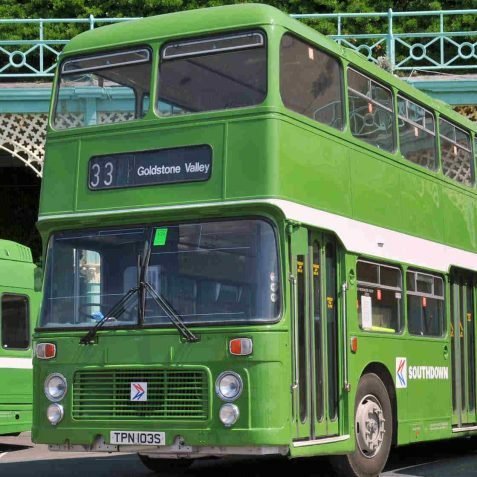 The fleet then consisted of a Bristol Lodekka which I loved, two petrol Maidstone and district coaches with a front sliding door with a fin on the roof at the rear, and a Maidstone and District diesel one man operator single decker bus. The firm let me take this bus home in the daytime when there was a glut of work going as I had to pick other workers up for different shifts. I didn’t want to use my own fuel going to and from Harrimonds to pick up the bus so they agreed to let me use the bus. I took the one man operator bus home every morning and parked it in Roedean Road for the day until I started work again in the late afternoon. One day after I had taken the girls to work on a morning run I picked my wife up to take her shopping (naughty) before I parked the bus up for the day. She was heavily pregnant at the time and her water broke as we were going along Eastern Road. Quite convenient really as we were near to the Royal Sussex County Hospital. My second son Mik was born a half hour later in the maternity ward in the tower on October 19th 1971. I also drove a school bus in London for a few years for the then ILEA. 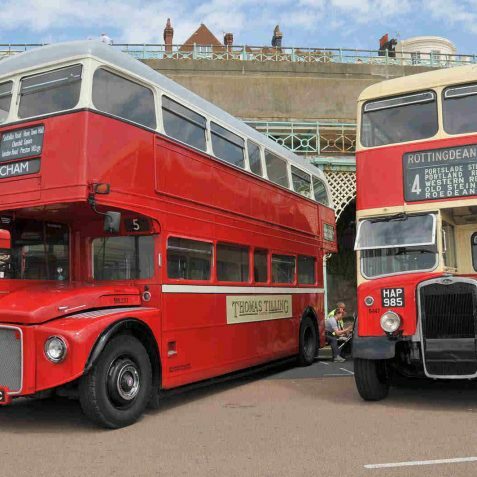 What intrigues me about the photos of the lovely buses above is the AEC Regent FUF 63. 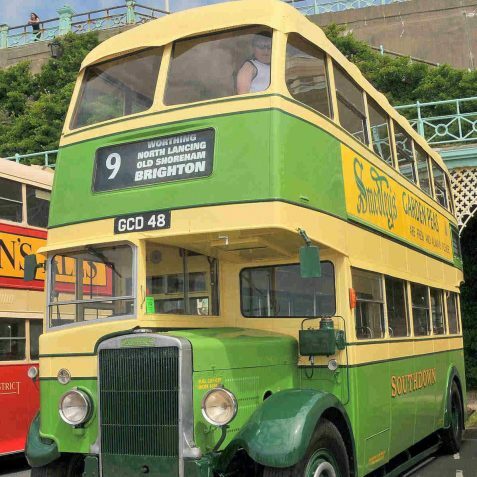 I must have been on this bus at some time or other in the 40s and the 50s as the 7b was one of the buses that we caught many times from Brighton Station to home when I was a kid. 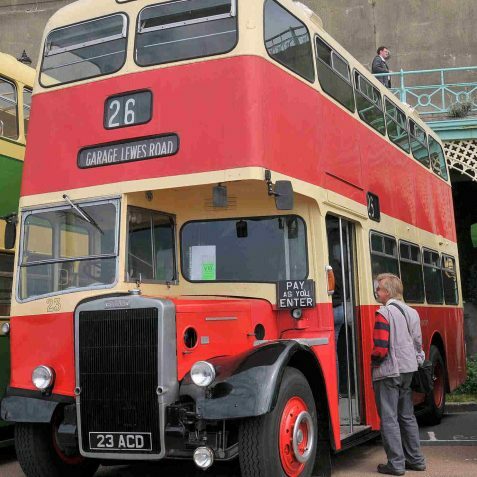 I have also been on the number 17 seafront bus in the 50s to Rottingdean, which to myself was enthralling on the top deck. Mike Peirson. Phil Allsopp, I remember your dad Bill very well, he lived at Chester Terrace. 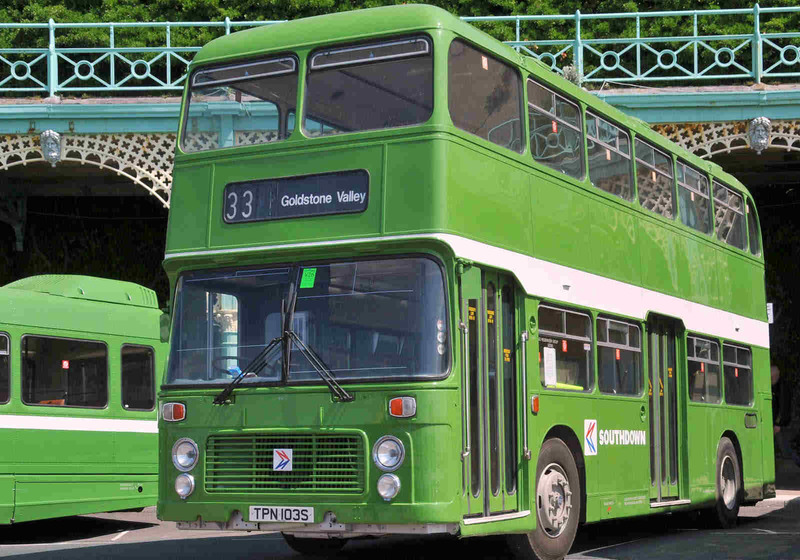 I started on Southdown in January 1969 as a conductor, then went driving out of Edward Street garage that summer. 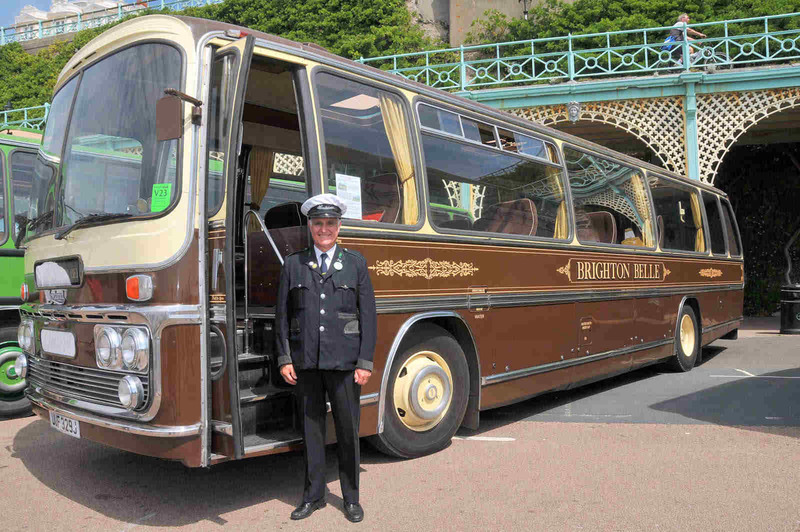 I have just retired 12 months ago, so I can say I drove buses in 6 different decades. I remember so many old drivers, some who started on Southdown in the 1930s. I remember most people mentioned here. Bill Allsopp was an Inspector at Pool Valley when I joined Southdown in 1974. I can remember Mick Clifford who was in the Terry Matthews, Mick Browning, Ian Funnell etc etc etc generation. Graham Maskell was with the BH&D side of things and transferred over. As for Sean Howlett, he might not remember me but I remember him. He was a drinking buddy in the Greyhound, East Street and he was the first conductor I worked with after passing my PSV. Good days but probably didn’t appreciate it at the time. I forgot to mention in my last comment that I also remember Barry Judd and his dad, Joe. I crewed with both of them when I was a driver. Great blokes both of them. If Barry is reading this – “it’s snowing in Patcham”! I drove this bus between 1968 and 1971. I recall many of those names and faces. Many will remember my father- Eddie Cosham, from parcel boy 1930s (war) then retirement (1948), secretary of sports club etc. I have found a whole set of the Southdown journals in the loft. I may have to e bay them. Graham – I remembered Eddie Cosham very well as I was a traffic trainee and was in the Express / Coach office for years so had a lot to do with publicity which was his province, amongst other things. Great guy, and did a lot for the company Sports and Social Club. There are a lot of people who would like those journals – the Tweenus or later Southdown Chronicle, particularly, I guess, Chalk Pits Museum at Amberley. It’d be good if they could be in the public domain and all together.